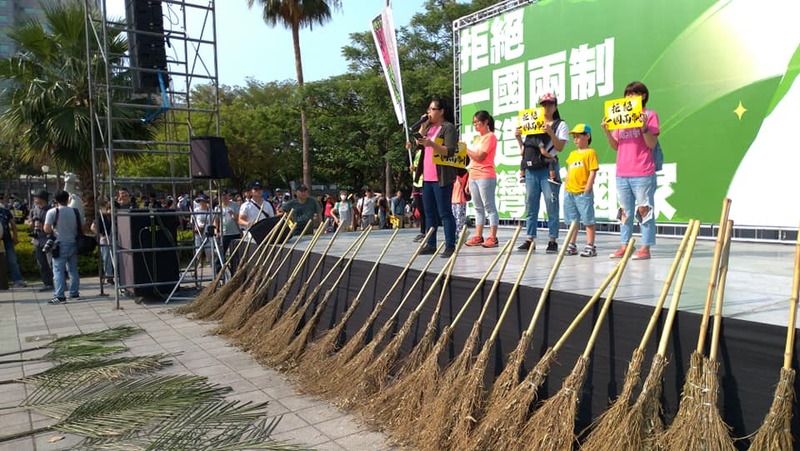 SEVERAL THOUSAND marched in Kaohsiung last Sunday against growing Chinese influence in Taiwan. 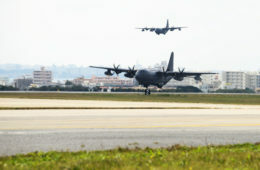 According to estimates, between 2,000 and 3,000 participated in the march. 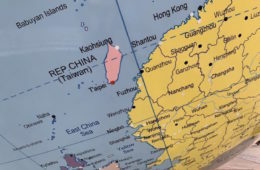 The march was directed against efforts by the KMT to facilitate the political unification of Taiwan and China under the auspices of “One China, Two Systems”. 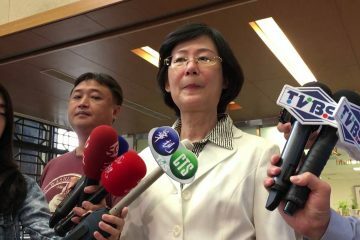 In past months, the CCP has strengthened its emphasis on political unification under this framework, citing Hong Kong as a successful example of this at work, and raising that force is still on the table if Taiwan continues to resist efforts at facilitating the political unification of Taiwan and China. 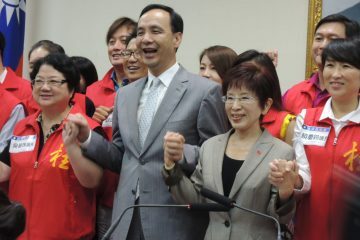 Likewise, the KMT has emphasized that it intends to pursue continued cross-strait exchanges with China, inclusive of city-based exchanges by KMT mayors, trade deals signed with China, and even signing a peace treaty with China to end the Chinese Civil War. The latter proposal could potentially involve ceding away Taiwan’s political freedoms under the framework of such a hypothetical peace agreement. 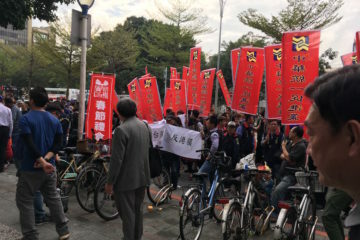 Demonstrators began at the Labor Park in Kaohsiung before finishing at the Kaohsiung City Hall. One of the key organizers of the protest was the Taiwan Citizen Front, a new alliance formed by Lai Chung-qiang, the convener of the Economic Democracy Union, an organization which had played a key role in organizing NGOs and civil society groups in demonstrations against the CSSTA trade agreement which the KMT tried to sign with China in 2014. 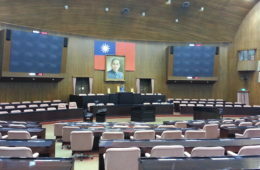 Opposition to the CSSTA was what eventually sparked the monthlong occupation of the Taiwanese legislature that later became known as the Sunflower Movement. 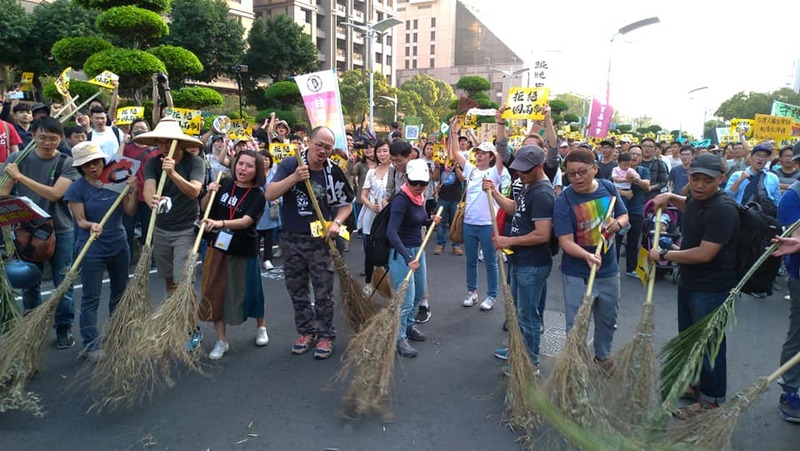 In particular, however, the Taiwan Citizen Front is intended to be a new organization which links together civil society groups and smaller third parties closely aligned with Taiwanese civil society that emerged after the Sunflower Movement, such as the New Power Party. 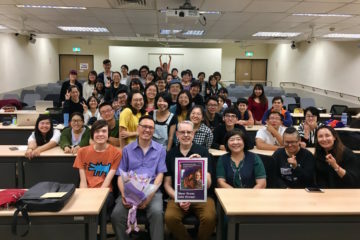 Indeed, among the speakers was Sunflower Movement student leader Lin Fei-fan, who took the opportunity to criticize recently elected Kaohsiung mayor Han Kuo-yu for attempting to sell out Taiwan’s political freedoms to China through trade deals, as a means of furthering Taiwan’s economic dependency on China and in that way paving the way of eventual unification. 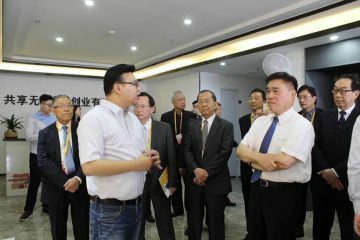 Speakers also warned of Chinese infiltration of the news, as observed in the lack of reporting on news stories unfavorable to China in Taiwanese media, and constant reporting on the achievements of Han Kuo-yu, who China may be hoping to prop up as a political challenger against Tsai and the DPP. Chinese student Lee Jia-bo was also a speaker at the rally. 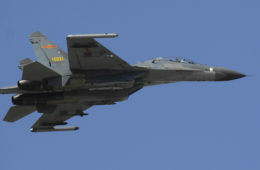 A Chinese student studying in Tainan, Lee is currently seeking asylum in Taiwan after making comments critical of Chinese president Xi Jinping. 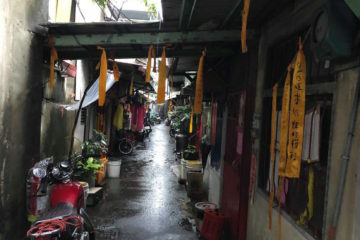 But in the absence of any formalized policy for dealing with Chinese refugees, his status remains in limbo. According to Lee, since he made comments critical of Xi and announcing his intent to seek asylum in Taiwan, he has lost contact with his family in China. 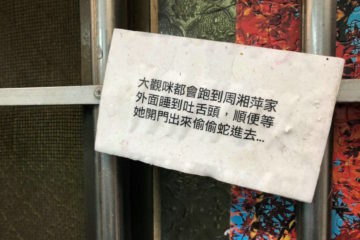 It is not impossible that his family has been detained, as observed in another recent case of a Chinese student expressing support for Taiwan. 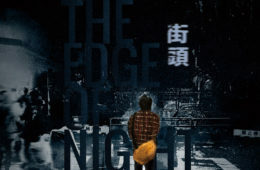 This other student, surnamed Liu, was studying in California, but he has since lost contact with his mother after comments critical Xi and supportive of Taiwan, his mother having been taken away by Chinese security forces. 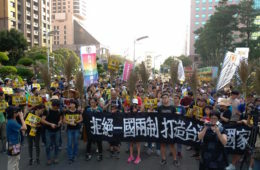 The march on Sunday took place on the 40th anniversary of Taiwanese free speech advocate Nylon Deng’s self-immolation in 1989, Deng having fought for press freedoms in Taiwan as the publisher of Freedom Weekly during the authoritarian period. 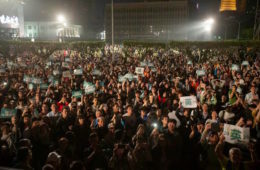 The march also took place one day after a large-scale concert in Taipei during which youth activists rallied in support of DPP president Tsai Ing-wen. 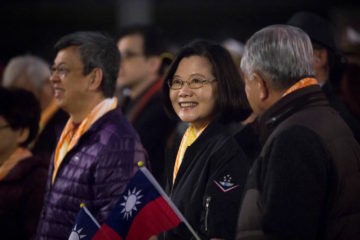 Yet fears are on the rise among civil society actors that the China factor has dropped out of the picture for many Taiwanese voters, hence the widespread electoral successes of the KMT last year during nine-in-one elections. 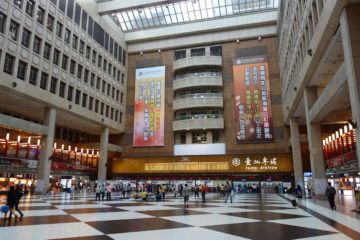 Indeed, Kaohsiung’s Han Kuo-yu remains highly popular, despite that Han has made no secret of the fact that he wishes for closer political ties between Taiwan and China. 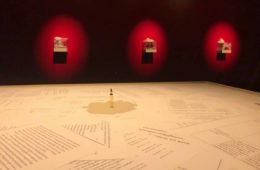 Similarly, in spite of the fact that Nylon Deng’s self-immolation is commemorated yearly in Taiwan as a landmark event of Taiwanese democratization, the police officer responsible for the series of events that led to his death, Hou You-yi, was recently elected mayor of New Taipei as a KMT candidate. 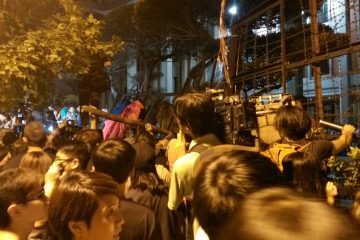 Demonstrations such as Sunday’s, then, would be civil society’s attempt to remind Taiwanese society of the danger posed by China. 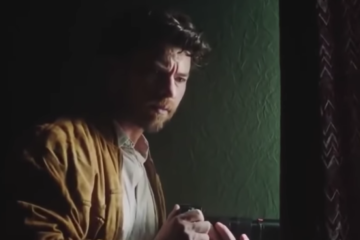 Whether this will be successful or not remains to be seen. 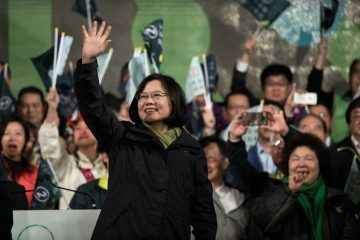 Is the Narrative About Taiwan Changing After Tsai Ing-Wen’s Presidential Victory? Political Motivations for the Execution of Subway Killer Cheng Chieh? 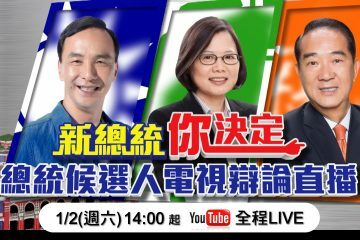 Is Fault For the KMT’s Debacle Not With Hung But the Leadership of the KMT’s “Non-Taiwanese” Leaders?